I started digiscoping with a Panasonic DMC G3 camera. After some time I changed the camera for a Panasonic DMC GX1, because it was a little lighter and easier to handle, because the camera had more buttons on the backside to change menu items more quickly. In July 2015 I changed this camera for a GX7, mostly because of the focus peaking option, but I also quickly appreciated the better IQ, the somewhat better noise handling and the much faster burst modes. My first telescope was a Swarovski ATM 80HD. When digiscoping from my car though, I had a problem looking through my camera, because the angled eyepiece holder made the position of the camera too high for me. That's the main reason I decided to upgrade to a Swarovski STX and ATX 95 mm telescope. I use the ATX eyepiece module when walking around and the STX module for digiscoping from my car and from observation hides. And I soon found out that the resolution and light grasp of a 95 mm objective are noticably better then that of the 80 mm objective of my first telescope. The 95 mm telescope - with digidapter - is shown on the photograph below left. To carry my rig when walking around or on my bike I use a tripod carrier as can be seen on the photograph below right. To be able to find birds easily I use a 'red dot' finder. Amateur astronomers (another hobby of mine) use these on their telescopes to find celestial objects, but they can without any problem be used to point a spottingscope with or without a camera to a bird. They are not expensive and can be easily mounted. Mine is mounted on the connection rail of my telescope, as you can see on the photograph to the right. The red dot finder workes on a small battery and projects a red dot on a small screen (so not at the bird). That dot must be pointed to the bird. There is very little parallax, so very good accuracy. And very fast. Red dot finders can be bought world wide. My tripod is a Gitzo G1327 mk2 and the head is a Gitzo G2380 fluid head. 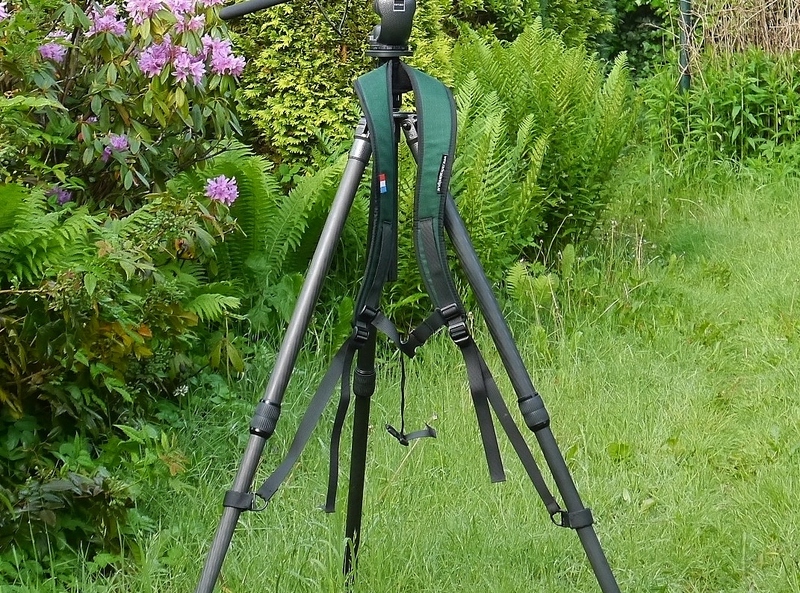 It is a very stable combination, especially because I never have to use more then two parts of the tripod legs and there is no need to use the center collumn. My first adapter, the one I used on my 80 mm telescope, was a Swarovski DCB-A adapter. When I started digiscoping I was a birder for many years and the possiblity of swinging the camera away from the eyepiece was a very welcome option. When I bought my 95 telescope I also bought the DCB-II. Then some people adviced me to use a digidapter instead. I had read about the digidapter, but the fact that the camera could not be swung away like it could with the DCB's, I never felt the need to try one. 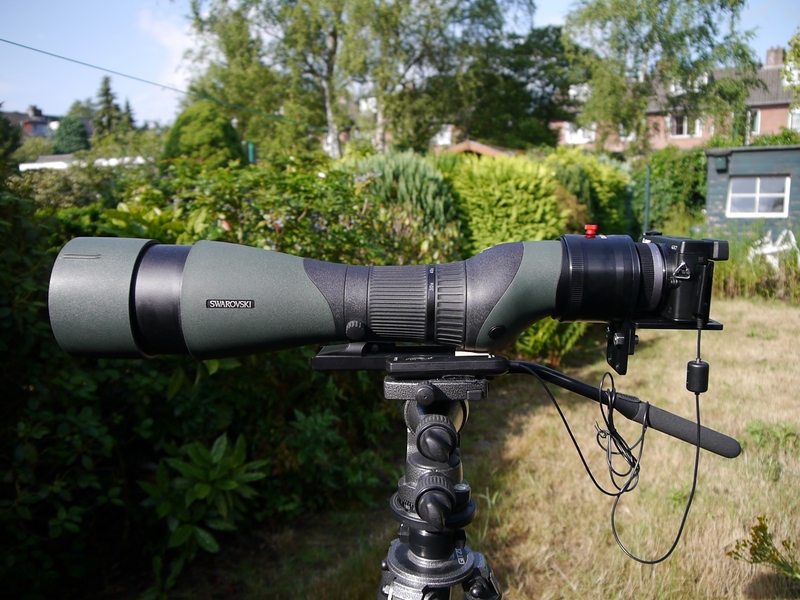 But now that I more often go out digiscoping instead of primarily watching birds, I was more interested and decided to buy one. And already after the first time I used it, it became without any doubt my favourite adapter. The most important reason is, that it is much sturdier then the DCB-II and much less prone to vibration. Paul Sayegh, the maker of the digidapter, cut of a small piece of one side of the adapter, so that I don't need to dismount the camera to change batteries, which is very convenient. I am sure that from now on I will only be using my DCB-II while birding, when I only attach the camera to be ready when a rare bird comes into view.